A recipe is like a rumor. It changes as it is passed around. We hear what we like to hear, read what we like to read and how we interpret things is much affected by what we read between the lines. 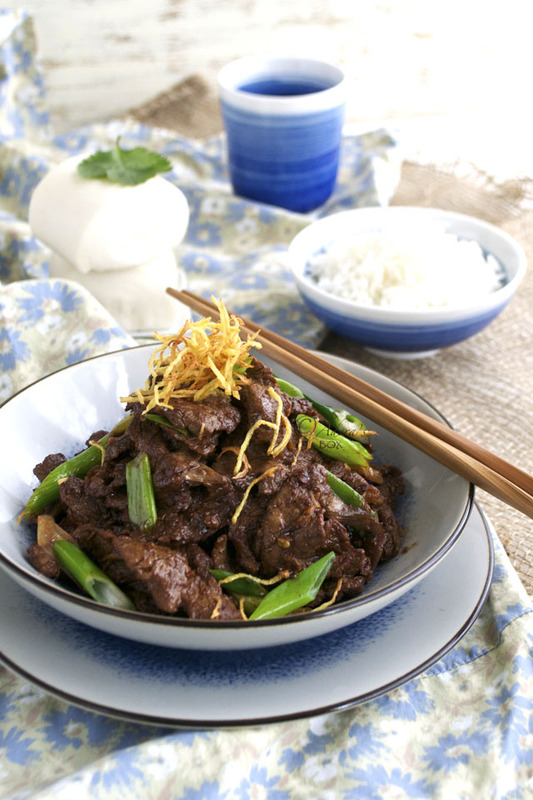 As I searched for a recipe of Mongolian beef, I was amazed at how different each one was. In essence, the recipe is as basic as Chinese food can get but if done properly, the result is pretty fantastic. Follow the basics of stir frying for a great result each time. 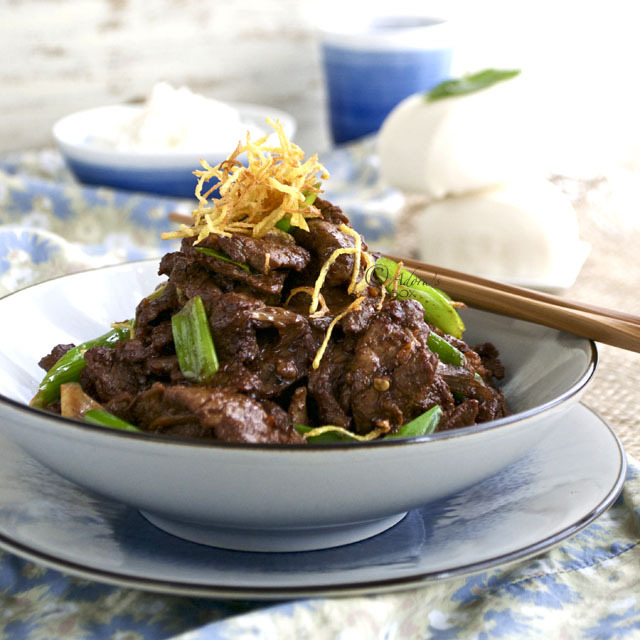 My recipe for Mongolian beef is pretty simple and straightforward. Thinly sliced strips of beef sirloin is fried twice. The first time is done briefly in very hot oil. This step is called velveting. 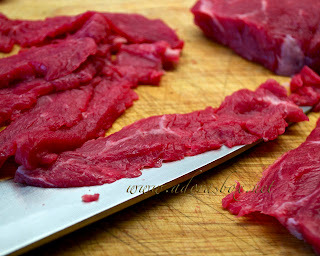 This makes the beef tender and juicy as it seals in the meat quickly. The rest is basic Chinese stir frying. The trinity of antioxidants, garlic, ginger and spring onions start the stir frying process as usual. 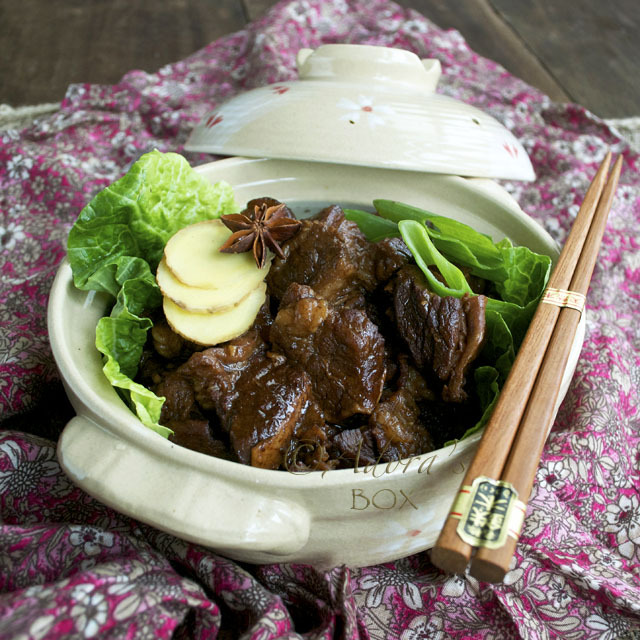 A large amount of spring onions is the characteristic ingredient of this dish. Salad onions or baby leeks are best as they are sweeter. The amount of heat is subject to personal preference but I think it has to be pretty hot to be exciting. Aside from chilli oil, I also used fresh chillies. This transforms an ordinary dish into a excellent one as it complements the sweetness and saltiness of the glaze. To finish, I added a personal touch: a sprinkling of crisped ginger shreds to top the dish. 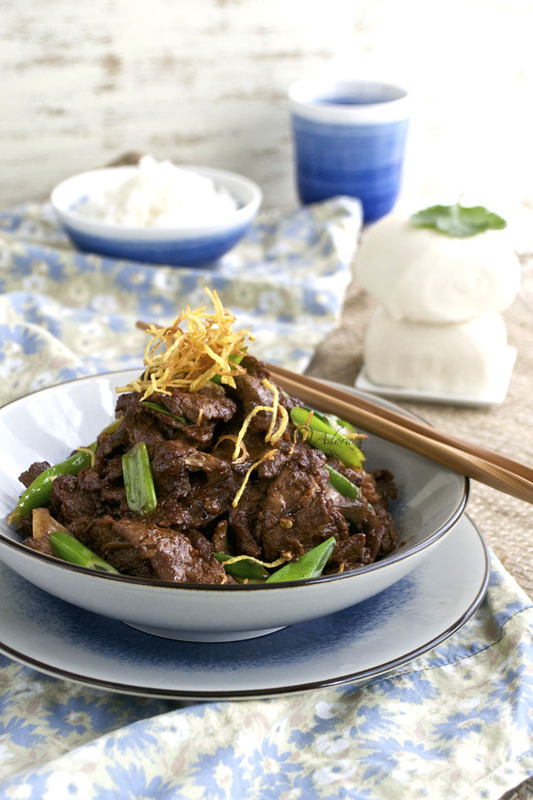 Don't miss that one out as it adds a sudden exciting twist to simple Mongolian beef. Steamed rice is the simplest way to complete this meal-in-minutes. 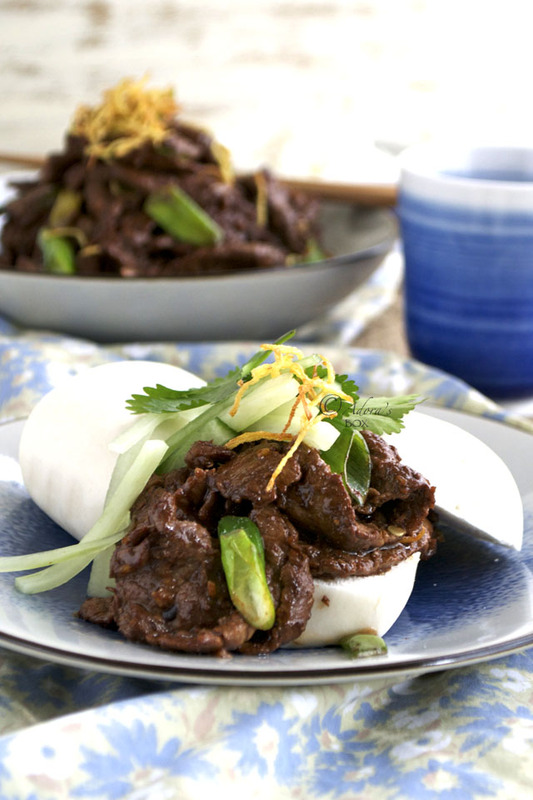 Mongolian beef is also incredibly delicious as a filling for steamed buns (recipe here), topped with cucumber shreds and coriander leaves (cilantro). Slice the beef across the grain, thinly. The best way to do this is to slant the knife diagonally across the meat. Mix the egg white, 1 tbsp. light soy sauce, sesame oil and a quarter of the chopped garlic in a mixing bowl and add in the beef. Stir very well. When mixed, add the corn flour and stir again. Set aside and prepare the rest of the ingredients. 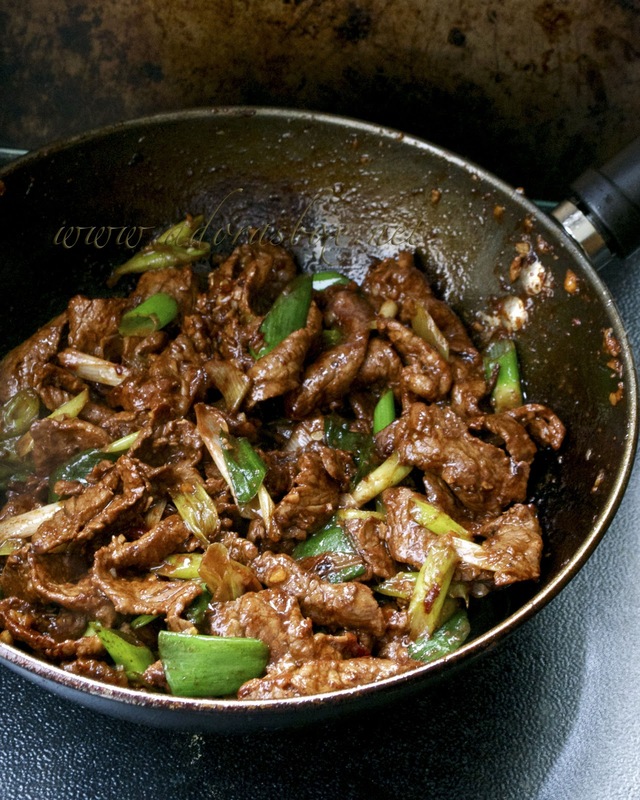 Mix the sherry, light and dark soy sauce, vinegar, hoisin sauce, brown sugar, chilli and sesame oil together. Set aside. Heat up a small pan or wok and add in the cooking oil. When the oil is hot, add in three quarters of the shredded ginger and fry on medium heat until golden brown and crisp. Skim off and set aside. Bring the temperature up and reheat the oil. When the oil is very hot and smoke rises from the surface, add in the seasoned beef all at once. Stir, on high heat until it changes colour. Take off the heat, strain and shake off the excess oil. Heat up a clean wok. When very hot add 2 tbsps. 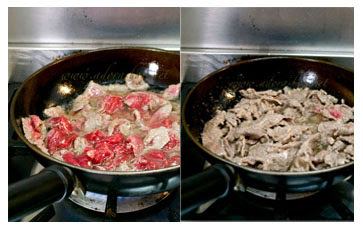 of oil (you can re-use the oil you've used for frying the beef). Add the garlic, ginger and red chilli. Stir fry for 1 minute. Add the fried beef and the white parts of the spring onions. Stir fry for three minutes until the spring onions are part cooked. Pour in the sauce mixture. Stir fry until all the sauce is absorbed. Add in the green parts of the spring onions and give it a final stir just for 1 minute. Transfer to a serving dish and top with the crisped ginger. Wow.. Looks delicious!! We love mongolian beef!!! Its such a great flavor. We love it paired with brown rice..
Hi Adora! Love and agree with your comparison - that recipes are synonymous with rumours! 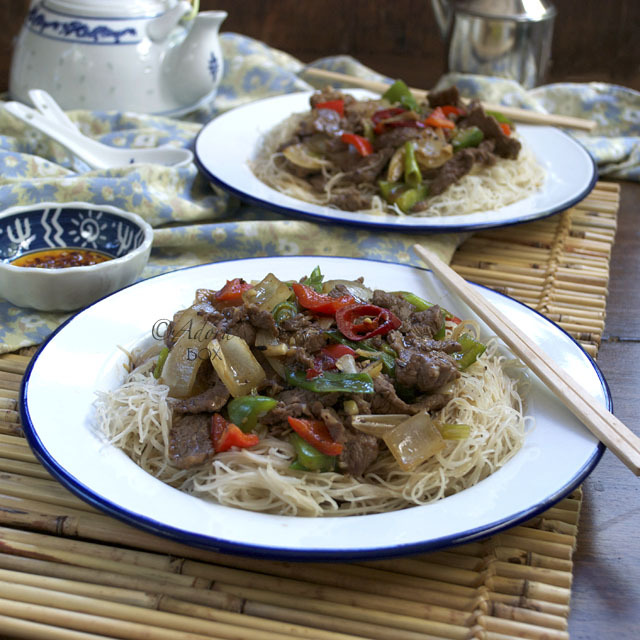 Gorgeous beef stir fry! Perfect dish to go with rice! You know, Adora, i've akways wondered why mongolian beef were so different from one restaurant to another. Now i know! Mongolian beef is not from mongolia LOL. But this sounds nice, i will try soon. Hi Adora, if this dish is on my table right now, I can finished it within 3 minutes,LOL....Simply yummy!!!! Love the simile - "A recipe is like a rumor"! That is so true! 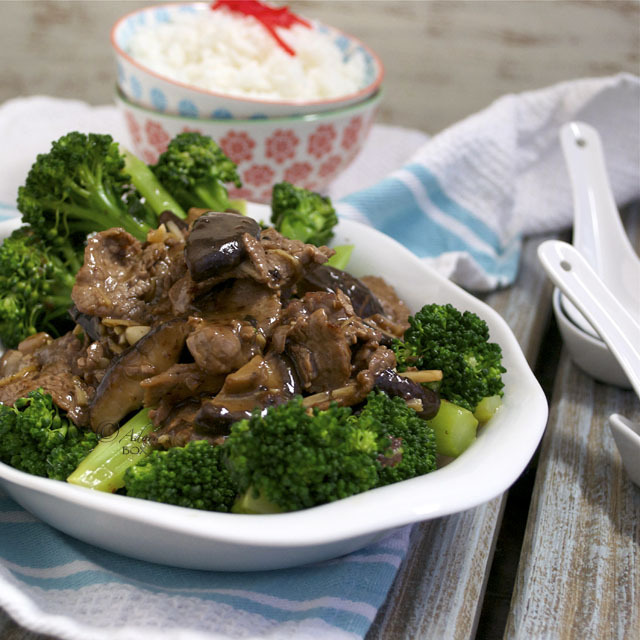 :) I do love your version of Mongolian Beef! I've never made it, but looking at these beautiful pictures and reading through your recipe I'm asking myself "and why not?"! I love dishes like this, and now that I know how easy it is to make, it will definitely grace our table soon! Thanks!